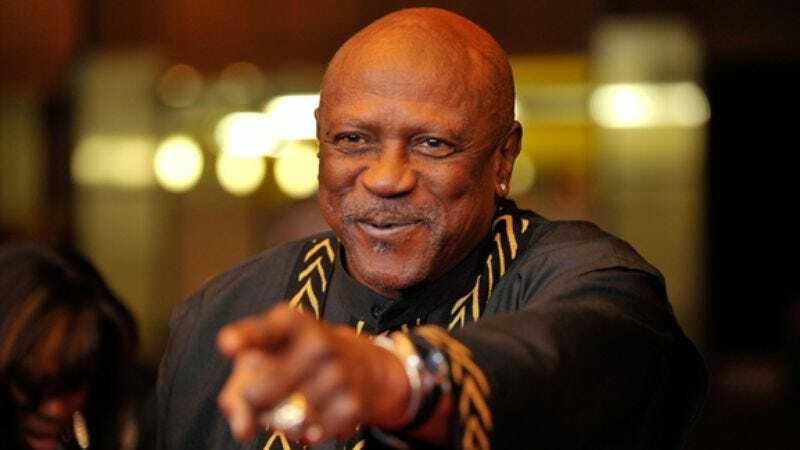 The actor: If Louis Gossett Jr.’s life were fiction, it would strain credibility. He starred on Broadway while still a teenager, and hung out with beatniks and legendary folk singers playing the coffee shops of New York in the ’50s and ’60s. He starred in A Raisin In The Sun opposite Sidney Poitier on Broadway and in the 1962 film adaptation. He partied with Sammy Davis Jr. and the Rat Pack while acting opposite Davis in the Broadway musical version of Golden Boy, wrote a song Richie Havens performed at Woodstock, and narrowly avoided being killed by the Manson Family. By the time Gossett picked up an Academy Award for Best Supporting Actor for playing a gruff-but-loving drill sergeant in 1982’s An Officer And A Gentleman, he’d racked up enough unforgettable experiences for several lifetimes, but he was still nearly three decades away from writing his recently released autobiography, An Actor And A Gentleman, which chronicles his professional triumphs, battles with drugs and alcohol, and efforts to fight racism via his charity, the Eracism Foundation. Louis Gossett, Jr.: That was very fortunate, obviously, because they used the original cast from the play. That got me to Hollywood, but we had to stay at different hotels. I can’t remember the name of the hotel, but it was pink, and had a lot of cockroaches. [Laughs.] The best part of it was that on the set, I met [director] Dan Petrie, and I got a chance to work with Diana Sands one more time, and Ivan Dixon and Sidney [Poiter] and Claudia [McNeil]. And especially Ruby [Dee]. I knew right away that this was special. It was my way of learning how to work in feature films. We had to tone down our Broadway performances, to rethink our approach. Otherwise, we’d be mailing it in. The director, Dan Petrie, allowed us to recreate A Raisin In The Sun for film, and we did it. AVC: Did your stage experience with the role make it easier? LG: No, I believe that was during Movie Of The Week. That was during Companions In Nightmare. LG: That was at Universal in ’68, with Lou Wasserman and my agent Ed Bondy. They got me treated very well, like a king, like they were doing in New York. Of course, I grew up in a neighborhood where it was very homogeneous. I was president of the schools in junior high and high school, got a scholarship to New York University, played a little basketball, and was a celebrity. All through Broadway and all of the agents and stuff, we all grew up together. It was a love affair, very diverse, a bunch of wonderful people. It was just wonderful. So they put me on first class in a TWA, the motors still had propellers, and then when I got out, they drove a Rolls Royce out there, a limousine. I’m impressed. They sliced the meat in first class. People wanted to know who I was. They thought I was an African diplomat, or somebody’s son. Finally they took me to the hotel, the Beverly Hills Hotel, and it’s a piece of trivia, but I think I’m one of the few African-Americans ever to stay at the suites at the Beverly Hills Hotel. Most of the people were African diplomats. And the hotel staff treated me wonderfully. There was a note that I had to pick up my rental car. You know Los Angeles, right? So I took a cab from the Beverly Hills Hotel to Hertz Rent A Car or Budget at Crescent Heights and Sunset Boulevard. What they had for me was a solid white Ford Fairlane, with a hard top that turns into a convertible. It was white on the outside and red on the inside. I took the top down and turned on my favorite Sam Cooke R&B station, put my shades on, and I was in seventh heaven. But it took me four and a half hours to get from Crescent Heights and Sunset to the Beverly Hills Hotel. I was stopped every 15 minutes by a different cop. By the time I got to the third cop, I knew the routine. They just wanted to stop me and embarrass me. “Put the top up and turn the music down.” First time in my life I had been confronted—nah, not in my life, but it was the first time I was that confronted—by racism. AVC: Did you think at all about suing them for violating your civil rights? Was that even an option at the time? LG: No, not then. I was in shock. Finally, I got an official apology, but it was because they were ordered to. But it was the mentality of the people at the time, sons and daughters of people from the South who came west to work in the factories. They became the schoolteachers and the blue-collar workers of Los Angeles. Not Hollywood so much. That’s the way it happened. I had the same problem in the first couple of days in Hollywood. That’s what they were raised to do and think and feel. Until something dramatic happened that changed their minds, they were like that. Understanding that they’re like that, at the end of the book, that’s why I have the Eracism Foundation, to make sure all children don’t have those differences. AVC: They were socialized to be racist. LG: Yeah, coming out of Alabama, Georgia, Mississippi, and Texas. The factory parts for the Army, the Navy, and the Air Force, and that’s who got those jobs. LG: That was a great experience with Sammy [Davis Jr.] He pulled me in, because I was an actor and he wanted to be an actor. He liked my performances that I had done in the theater, and he was impressed. He said, “Okay, put him in.” They wrote a part for me, playing the freedom-fighter brother. I had a song. I was understudying Billy Daniels, and I got to do that and act for Sammy. He pulled me into the [Rat Pack] to hang out. I couldn’t hang out. I had no practice at hanging out. I’d fall asleep in the bathroom. I’d sleep to 4 o’clock in the morning, and they’re still laughing and dancing and singing. And sure enough, in fine form for the performance the next day. I don’t know how they could do that. I could not. But I loved the experience of working with Sammy and understudying Billy Daniels, whom I loved a lot, and knowing all those people. Great bunch of people. LG: That was an educational experience, going to Africa. Now, a very funny thing that happened there: They had their first experience with national television six months before I got there. So the things they saw were the things that we were doing in New York. The Nurses and Judge For The Defense and East Side/West Side, and all those particular shows. So I got that character, and I had just finished an episode of The Nurses in which I die from a gunshot wound to the chest. Now I get off the plane, and everybody’s looking at me, and I don’t know if they want to eat me, I don’t know. It was my first time in Africa; what are these people looking at? I went to the Nairobi Hilton, and they went bananas, the crowds outside. “He’s here!” “I’m here? What are you talking about, ‘I’m here?’” Finally someone who spoke English said, “They want to know. They want to see your chest.” I said, “I don’t have muscles.” “They want to see your chest.” So I opened up my shirt, and there’s no scars on my chest. They finally explained they saw The Nurses, and I got shot in the stomach and I died. How did I come back to life and get rid of those scars? This was their first experience with television. They’re not used to television. AVC: It sounds like you had some close calls while filming Bushbaby. LG: When the British and the Europeans had to give up their possession of African countries, there was an element called the obstructionists. They didn’t want it to go down smoothly. If it went down smoothly, they had to get out sooner. So I was raised, and helped raise this young girl, who was born in Africa, and her pet is a bushbaby. It’s like a combination of a monkey and a squirrel. That’s what the story was. She jumps off the boat to leave him in Africa. The boat sails away. She finds me, and we have to run, because the obstructionists are accusing me of kidnapping her. It becomes a race just before the rains, which was very beautiful. There’s a shot where the helicopter flies us, and they try to run me down. To keep me out of danger, we dig a ditch. The helicopter’s got to come in at an angle. It looks like it’s very close to my head. I dive at the last minute, and the helicopter cameraman gets his shot. But the helicopter was flying about three feet off the ground. There was no place for me to dive. I got real tight, and the wind went over my back, and the breath of death hit me, and everybody said, “What a great shot.” Then I got up, and the next thing I know, they were trying to take my hands off the man’s neck. He had a smile on his face. He knew what he was doing. But The Bushbaby turned out to be a good movie. AVC: It seems like if you’re going to be a pilot like that, you have to be a bit of an adrenaline junkie. LG: Oh boy. He got all my adrenaline. I went to black. I went black. I don’t remember putting my hands on his neck at all. LG: Hal Ashby was a great man. A great man. I had some great experiences with Hal and Diana Sands and Beau Bridges and Pearl Bailey and Lee Grant. We had a very good time. For a lot of us, it was our first major motion picture, and we had a ball. An absolute ball. My favorite scene is when Copee goes crazy. It’s a magic scene there. I was very satisfied with that performance. That entire movie. AVC: In the ’60s, you were in the play The Blacks by Jean Genet. It sounded like that was a surreal experience for the cast and audience. LG: Everybody who made it came out of that cast, from Cicely Tyson to Roxie Roker from The Jeffersons to Maya Angelou, Godfrey Cambridge, Roscoe Lee Browne, James Earl Jones, and myself. We all did it on and off for five-and-a-half years. AVC: For people who have never heard of it or aren’t familiar with it, could you talk a little bit about what The Blacks was? LG: It was Jean Genet, who brought from France the Theater Of The Absurd. The avant-garde. We had some writers in America who were avant-garde, the Edward Albees. But the Genets and the Jean-Paul Sartres coming out of France were doing the avant-garde stuff. Samuel Beckett was one of those particular people. This was Jean Genet. It was a play within a play, so that when you show up at the theater, and you’re of a different color, you were treated a certain way. You were pushed around, so you become part of the play. It was really a great experience. It lasted five and a half years. AVC: It sounded fairly confrontational. LG: Some things were, yeah. People knew that when they came. AVC: That they could expect to feel uncomfortable? LG: Something uncomfortable, yeah. It was up to our talent to see if we could make them feel some kind of way. LG: Yep. I played the blacksmith. It was based on truth. There was Philippe Forquet, who was General Lafayette. Then there was Alex Henteloff, who was a young Benjamin Franklin. Rick Ely was a young American. Hilary Thompson, I believe it was, played a girl. We had a nice thing going. It didn’t last very long, but before that, before it was canceled at episode number 11 or 12. I was crashing free of charge at the place I was staying in Laurel Canyon, and finally the landlord was getting ready to put me out. [Laughs.] I got a check, because I had done folk-music writing in the summer in Greenwich Village, through which all of those historical performances came, the Bob Dylans and all those people. I was part of that. I emceed the Cafe Wha? hootenannies, they called it, with Paul Stookey—Noel Stookey’s his real name—of Peter, Paul & Mary. Through there came everybody. We passed a basket, they made a great deal of money, I left my songs with Richie Havens, and he subsequently sang “Handsome Johnny” at Woodstock and on an album called Mixed Bag. AVC: You were at Woodstock, right? LG: I was at Woodstock. In the mud. AVC: Reading your book, it seemed like you were everywhere in the 1960s. LG: Just about. Wanted to be in the now. There were a whole bunch of us there, in the now. Anywhere anything exciting was happening, we were there. AVC: You also came fairly close to being killed by the Manson Family. LG: When I was living in Laurel Canyon, we were there to welcome The Rolling Stones, and The Beatles were in town, and they were staying at the Chateau Marmont Hotel. We had taken pictures and were talking and stuff. Roman Polanski was there, and his wife, she was pregnant. It was a nice bunch of people. The Mamas And The Papas were there, the people I hung out with most of the time. So they said, “Everybody’s going to have late coffee and breakfast at Roman Polanski’s house.” Right around the corner is where my house is, so I’m going to go to the house, take a shower, and put on some fresh clothes. I take a shower, put on some fresh clothes, and turn on the TV, and there the news is. So I dodged a bullet. AVC: It seems like you escaped death an awful lot. LG: That was a nice experience. That brought me to San Francisco. We had a great deal of fun there. I had this very famous line, when the pimp reaches in his back pocket: “Whatever you’re going to pull out, it better be a sandwich, because you’re going to have to eat it.” That was the big quote for that movie. AVC: Then in 1974, you were in The White Dawn opposite one of my favorite actors, Warren Oates. LG: And Timothy Bottoms. It was us and 75 Eskimos. They relived what they knew they would never get a chance to relive again, so they put their heart and soul into recreating what it would be like. I loved them. I loved them all. AVC: It seems like it was life imitating art, in that you were three Americans going into Eskimo land and living among them. LG: Yeah, it was. They tried to fool us, because it never got real dark. So we said, “When are we going to wrap up?” and they said, “When it gets dark.” [Laughs.] But we caught them. LG: Didn’t last too long. It wasn’t honest to the original picture [Black Bart was the TV adaptation of Blazing Saddles], which is why it didn’t last. They got the wrong joke for the pilot. LG: It was just, the movie could do things you could not do on television. And they didn’t translate it properly enough from a movie to a television series. All the funny stuff was taken out. The best experience I had was working with Larry Hagman. Other than that, you could have just said it was a brand new story. LG: Absolutely. That was a very emotional, very beautiful, and cathartic experience for a lot of people. It was a celebration. It was global. Nobody knew that. It was even sweeter, because nobody knew that it had happened. Unexpectedly. Turned the wheel around. AVC: Why do you think it provoked such a powerful response? LG: It was just the timing. People wanted to see something that was fresh and new, and we supplied it. It showed the courage of television and proved a point. After that, there were some great miniseries. AVC: In your book, you say Roots ultimately proved a mixed blessing for African-Americans actors. LG: There was a backlash for about eight months to a year before blacks were working in television again. LG: That was fun. It got me to Bermuda, a place I never would have gone. A great summer: six months working with some great people, including Miss Jacqueline Bisset. That’s nothing to sneeze at. AVC: The conventional wisdom about movies involving the water is that they’re dangerous. You’ve done a couple, The Deep and Jaws 3-D. Did you find that to be the case? LG: They taught us pretty well. They were going to make sure we knew everything very well. And we did. We were over-trained. We were ready. So they wanted us to do the stuff, not our stuntmen. They wanted to put the camera real close. It had to be us. AVC: Then, in 1981, you portrayed Satchel Paige in Don’t Look Back. From your book, it sounds like he was literally sitting on the set in a rocking chair. LG: He was in a rocking chair for a lot of it, until he left. He was suffering from emphysema, so it was hard for him to sit there, but he was there as long as he could be. AVC: Did that affect your performance at all? LG: No, no. I did the best I could. AVC: That has to be a pretty juicy, satisfying role. What an iconic figure. LG: Satchel was wonderful. I’ve seen him in a movie with Robert Mitchum. I didn’t know he was an actor. He was a good actor. It was called The Wonderful Country, I believe. Shot in Mexico. He played a soldier. He did good work. LG: That was a lot of fun. The person I had most of the fun with was Eddie Murphy. The young Eddie Murphy. I played his father. I made friends with George Thorogood, but Eddie Murphy is who I did the scenes with. LG: That was a challenge. I prefer a challenge, because when you’ve done that, you’ve done something. That was something where nobody could see my face or my eyes; I was giving somebody a performance through that makeup. That was six months in Germany. A lot of pain in the eyes and stuff. LG: Well, I took 30 days and went down to San Diego, where I studied drill instructors and studied with them for 28 of those days. Then I came to the set with one of them, and when I showed up, I said I was the DI. I had to move away from them, because they didn’t take me seriously. So I didn’t hang out with anybody. I just moved away. AVC: It sounds like that was hard on you emotionally. LG: It was. It took a bit of a toll. But I was getting ready to do anything in order to do that performance. It was my shot, and I was doing as much as I could to do a good performance. AVC: Do you think it paid off in terms of the role? LG: Oh, sure, you know that. I got the Oscar. AVC: It was originally written as a white character, right? LG: No. When I went for that part, I don’t know what my agent said, but when I knocked on the door, he looked at me and said, “You’ve got the part.” I didn’t have to do anything. It was a case of “be careful what you ask for,” because now that I’ve got the part, I’ve really got to deliver the goods. LG: It did create a lot of opportunities, but I thought there would be more. I thought it would be a windfall. But it wasn’t. It was what it was. It only affected me for a little while, and then it stopped affecting me. I just come out the other end. AVC: Why do you think it didn’t lead to more things? LG: I don’t know, I don’t know. [This interview is] pointed to all the negatives. It doesn’t feel good. The whole of a 58- or 59-year career was wonderful. We’re highlighting some things that are negative, and that’s not a good thing. We’re going the wrong direction. LG: I don’t highlight those and then not talk about everything else. There are some great things that happened. AVC: It seems that you had a really amazing experience playing Anwar El Sadat. LG: That was very spiritual and very wonderful. I was such a fan of his, there’s some things about him that I knew so well, sometimes I don’t remember doing them. A lot of those scenes were taken in one take. Jehan, his wife, chose me, and some of the parts, some of the scenes, I only did once. It was a very magic experience. AVC: From the book, it seems like you had a sort of communion with Sadat, where you inhabited him while you were playing that role. LG: I understood him completely. AVC: It also made it sound like you became a bit of a hero in Israel and Egypt.